What’s it like to be two years old? Fun. Confusing. Unapologetic. This story is part of a series that looks at what makes the 2-year-old year so critical and what could be done to better support toddlers in America. 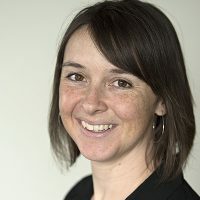 The series was produced by The Hechinger Report and Columbia Journalism School’s Teacher Project, nonprofit news organizations focused on education coverage, in partnership with Slate Magazine. Sign up for our newsletter. Or view the whole series. One of the wonders of the 2-year-old brain is how developed it is in some ways and how totally undeveloped it is in others. Bits of information an adult would find unimportant or unlikely are held in equal regard with facts that are critically important. Some tasks that come automatically for adults, like understanding the nature of a secret, are not possible for 2-year-olds. Other functions, like absorbing new information, are in surprisingly high gear. 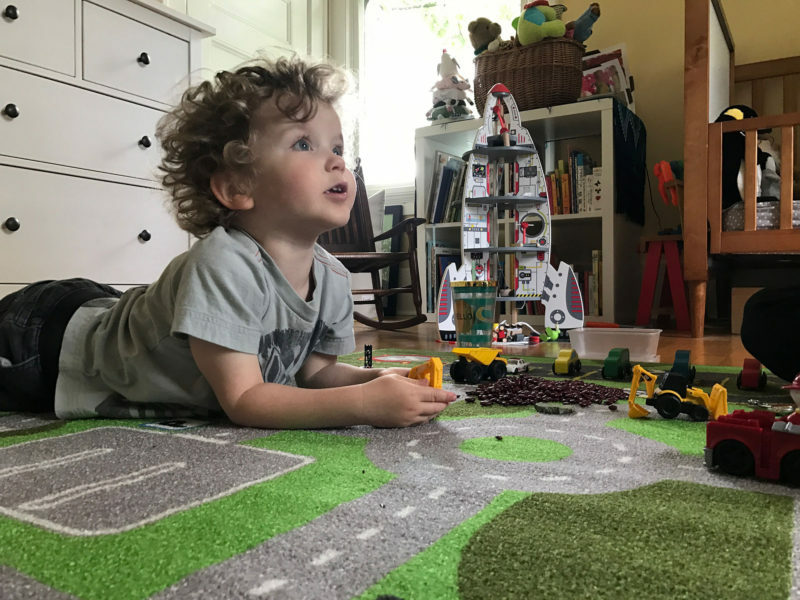 “It is a year of uninhibited exploration,” said Anna Waismeyer, who has spent years researching toddlers at the University of Washington Institute for Learning and Brain Sciences. That lack of cultural awareness combined with a yen for uncovering new information can lead to some funny contradictions. This impressive lecture on vehicle mechanics followed several minutes in which Clark nonchalantly tried to hide his red toy dinosaur down the front of his mother’s dress. Not once did he stop to wonder if I, his guest, might find such behavior awkward. And I didn’t, of course, because Clark was 2, and what can you expect? Exactly what can be expected of a 2-year-old is a question that plagues many parents during this year of rapid growth and change. In their 12 months of being 2 years old, most kids graduate from using a few disconnected words to speaking in nearly complete sentences. They also learn to jump, to understand that they may know things others don’t, and to use a toilet. 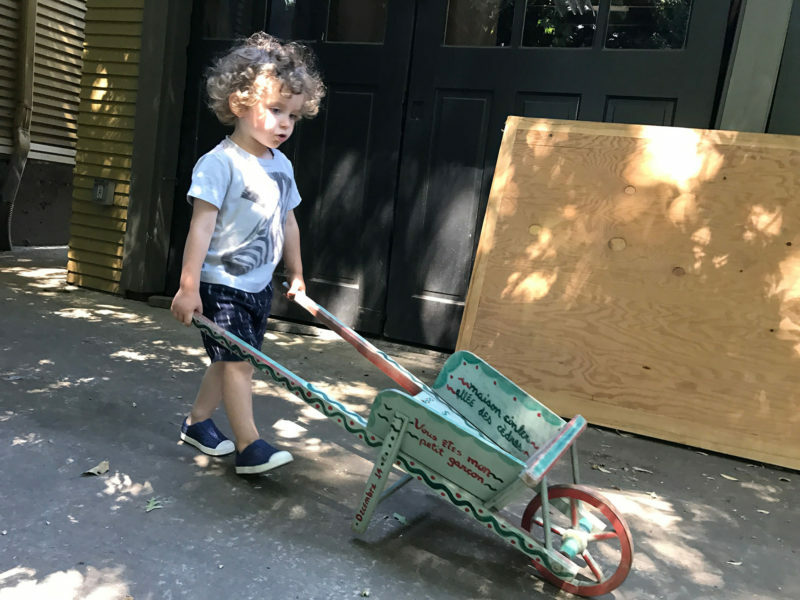 And while the exact timelines for these developments vary for each child, the trajectory of the third full year of life bends sharply toward independence. When children turn 2, most are producing some language. But toddlers’ vocabularies are limited, even when they are given lots of opportunities to hear and practice language. Clark, who has loved vehicles since before he could talk, first called everything with wheels a “car.” But by the time he was picking a theme for his third birthday, he could tell a backhoe from a dump truck and had requested that garbage and fire trucks (his favorites) be featured heavily at his party. A 2-year-old should be able to follow a set of directions—touch your nose, give me a high five—but may not be able to explain in words what he or she has just done. Children know when their parents are complaining about them or disagreeing with each other, so it’s also time for adults to start watching what they say in front of their children. Even a quiet 2-year-old, or one who prefers to practice his or her new language skills at home and not in front of strangers, is likely learning loads of language all the time, Waismeyer said. Significant delays in oral language during this year could be cause for concern. A 24-month-old with fewer than 50 words, a child who has trouble interacting with same-age peers or a 30- to 36-month-old who shows no interest in storybooks or drawing may have a language disorder and should be seen by a speech-language pathologist, according to the American Speech-Language-Hearing Association. 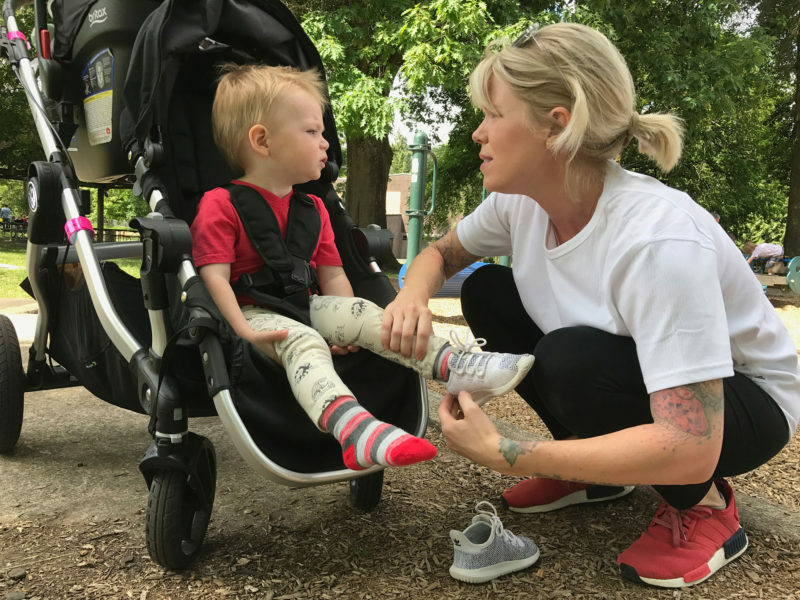 When children turn 2, many have been walking for less than a year and are still quite unsteady on their feet. Ask a 24-month-old to jump with two feet together, and the result is likely to be comical. By 36 months though, most have learned to run fluidly, climb confidently, and balance well. 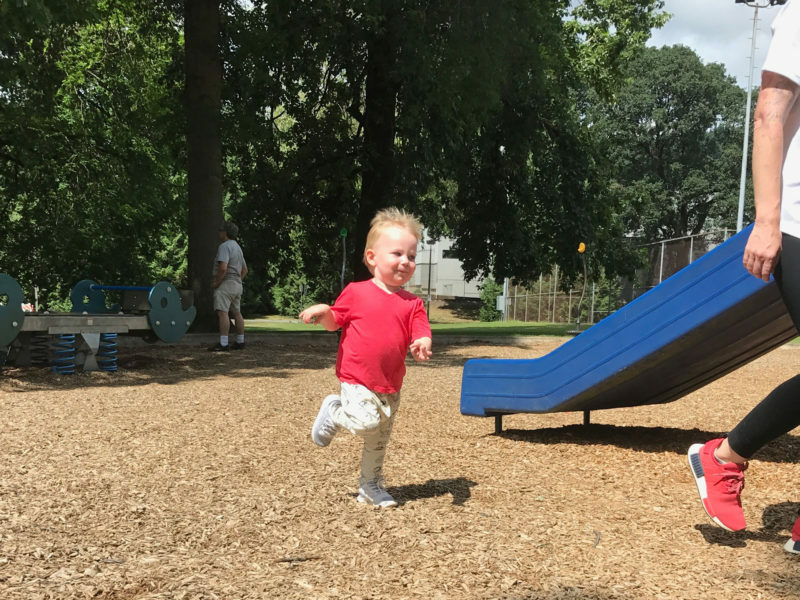 The ability to execute large movements confidently is as important a sign of healthy development as language, said Waismeyer, and she urges parents to pay attention to such milestones. Some kids jump first and speak second, and that’s OK too, Waismeyer said. Everett Duncan, 2, is several months younger than his cousin Clark. And while he’s not yet speaking as clearly as his older cousin, he’s quite physically coordinated. At the park one sunny day, Everett landed on two feet at the bottom of a slide and started running for the other side of the play structure to get back to the top. His steps up the stairs were ungainly, but he handled the kid-size rope ladder with ease and pushed himself off the top of the slide without hesitation. Many studies tie physical fitness to brain health in children. One Texas school district even found that offering four recesses a day improved academic outcomes. For younger kids, an increased ability to explore their environment may be the biggest benefit of more sophisticated movements: What’s under that rock? What happens when I push this block tower? How does the world look different if I lay on the bed with my head hanging back and my feet in the air? As with every type of development, kids change at different rates. Most children still move fairly awkwardly at age 2 and most sports-type skills—like kicking and throwing—are quite beyond children this young. Research has shown that less than one-third of children ages 2 to 5 are able to throw and catch effectively, according to the AAP. However, if a child is not walking confidently by age 3, not able to navigate stairs, or not demonstrating at least a fledgling ability to run, it may be worth talking to your child’s pediatrician, based on the AAP’s physical development guidelines for toddlers. Two is the age when kids begin to exhibit distinct personality traits and interests. Clark’s mother said one of his friends is always asking why something is true: Why is the grass green? Why is mommy a girl? Why is the dog sticking his tongue out? Clark prefers “what” questions: What is this called? What is the dog doing? What’s in that house? And while Clark loves trucks and dinosaurs and can talk about either at length, his cousin Everett prefers guitars and music and, since his little sister was born in February, the color pink. Two-year-olds are also famous for being stubborn little creatures with a strength of will that can try their parents’ patience. While this trait has earned 2-year-olds their “terrible” moniker, such behavior is just the outward sign of a more profound shift that is going on inside their brains, according to Waismeyer. At 24 months, 2-year-olds don’t understand that others don’t know everything they know. That also means they can’t lie. Waismeyer says parents often complain that their child is being manipulative by, for example, faking crying in order to get attention. But the child is not trying to convince anyone that he’s hurt, she explained. It simply hasn’t occurred to him that he could know he’s not hurt and that another person might think he is hurt. He just knows that the behavior of crying results in the adult behavior he wants—cuddling or Band-Aid giving, for example. To change this behavior, parents should explain to kids that Band-Aids are for getting hurt, not for crying, Waismeyer said. Though that may sound obvious, 2-year-olds often make incorrect connections between behaviors and outcomes and they are worth explaining. Also, it’s likely that the fake crying is a behavior the child knows will get him attention, Waismeyer said. Make sure that, as a parent, you are offering attention for more positive behaviors too, Waismeyer said. And telling kids the best ways to get your attention—and then following through when they do those things—is another good tactic. As Clark’s extensive engine knowledge demonstrates, 2-year-olds are also capable of retaining a surprising amount of information, Waismeyer said. That’s why explaining everything you know about a topic is actually the best option for interacting with 2-year-olds, she said. Two-year-olds won’t remember everything. But they’ll take what they can use and add it to their understanding of the world. For example, a child may not know the word “mayor” when it appears in a book. To make it easier for the child, a parent might change the word to “teacher,” which the child knows. But Waismeyer says it’s more useful to them if you stop and explain that a mayor is a person that runs a town. That way, the child isn’t left to wonder why this teacher sits in a big office and doesn’t have any students. And while you can’t rush developmental stages, Waismeyer said, you also can’t overdo the volume of new information you share with your child or encourage him or her to discover. So emphasize discovery by planting a seed in a cup with some dirt, then watering it and watching it grow. Or see what happens when you mix paint colors on a white page. Parents should generally avoid is insisting that 2-year-olds grasp everything like an adult or older child might. For example, don’t correct a child’s grammar when she tells the neighbor how much the plant in the cup “growed” or expect her to hold a paintbrush like a pencil rather than gripped in a fist. The best way for children to learn correct grammar and to hold a paintbrush properly is simply by observing older children and adults doing these things. Repeating a 2-year-old’s phrase back to them correctly, as in “Yes, the plant grew,” will eventually help them learn how to use the past tense. And showing 2-year-olds the “pencil hold” is fine, Waismeyer said, it’s just not helpful to insist they paint that way when their fingers aren’t developed enough to do so. A useful list of activities for parents and caretakers to do with infants and toddlers can be found in this free guide put out by the state of Oklahoma, which provides a list of age-appropriate activities in all of the primary academic subject areas. Most states have similar early learning guidelines. By the end of the 2-year-old year, most children will have moved beyond “parallel play,” in which kids play side-by-side, but not together, and be able to form actual friendships. By age 3, children will likely remember specific friends and may even be able to say what those children like and don’t like. In the meantime, the learning curve can be pretty amusing. At one of Portland’s many indoor play spaces for small kids, Clark played in a sandbox-size bin of rainbow-colored rice. He filled a cake mold with rice, poured it out, and then announced he was going to make a pie instead. He started filling a pie tin. When a friend joined him in the rice bin and discovered the joys of pouring rice through a funnel, Clark started trying to catch it with his hand. Then he started putting more rice in the top of the funnel. Seconds later, he was done with that and left to give his mom a hug and explore a new section of the play space. Clark’s interactions with the other child show how children at this age begin to take an interest in each other, but aren’t yet able to sustain ongoing verbal exchanges, play games, or engage in make-believe group play. Despite this, it is important for kids to have exposure to other kids, from whom they can learn about emotional cues, appropriate and inappropriate behavior, and the beginnings of what it means to have a back-and-forth exchange with a peer. Not all of these exchanges go well, and that’s normal too. 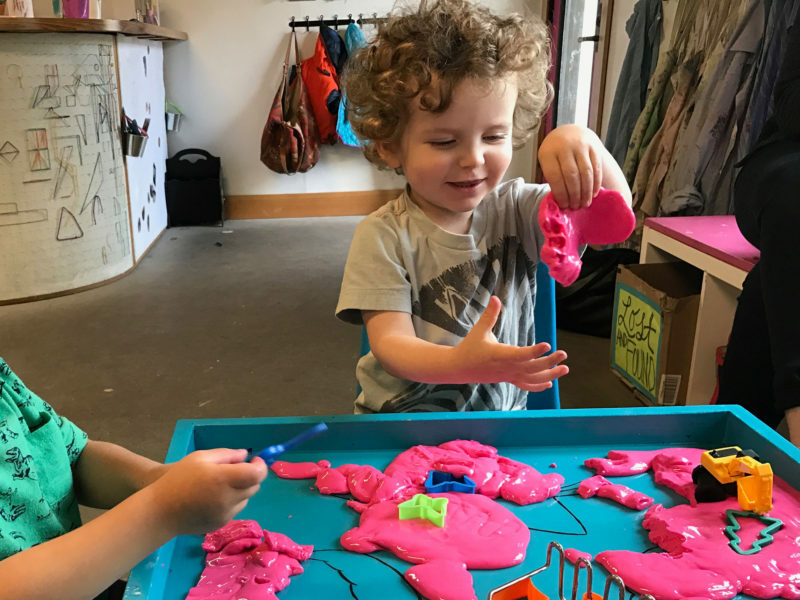 In another section of the play space, later in the day, Clark dissolved into tears when he wanted to keep all of the “oobleck,” a play-dough–like substance made from cornstarch and water, to himself and was told he should share it with another little boy. Such tears aren’t a bad thing, Waismeyer said. Letting a young child experience negative emotions in social situations also allows that child to learn. Plus, these skills prepare kids for the larger social environments found in school. Just as turn-taking, sharing, and learning to ask for help are all useful skills for students, so is knowing how to deal with feelings of upset and failure. This allows children to practice the important art of conveying information and allows caretakers to informally track their kid’s improving ability to answer open-ended questions. Two-year-old brains are evolving so quickly, it’s best to think of them as a work-in-progress. Nothing they do—not even the most frustrating behavior—is meant as a personal insult. Also, the vast majority of 2-year-old behaviors are spurred by a cognitive development phase that will soon pass. What kids this age need more than anything is not direct instruction, but gentle guidance as they grow and explore. This story was produced by The Hechinger Report, a nonprofit, independent news organization focused on inequality and innovation in education. Read more about early education and sign up for our weekly newsletter.